The season is just five weeks old and we already have our first coaching casualty—Charlie Weis by Kansas. Of course Weis’ departure should be no surprise after he went 1–18 in conference play the last two-plus seasons. 10. Michigan State (4–0): The Spartans rang up 42 first-half points against Wyoming en route to a 56–14 blowout. Quarterback Connor Cook had two TD passes against the Cowboys and has had two or more in all four games this season. 9. Baylor (4–0): After beating Iowa State 49–28, Baylor remains the highest-scoring team in the NCAA at 56.8 points per game. Passing-wise, after Bryce Petty went 30/44 for 336 yards against the Cyclones, the Bears are now fourth in the NCAA with an average of 401.3 a game. 8. UCLA (4–0): The Bruins may have had the most impressive win last week by anyone on this list—a 62–27 drubbing of previously unbeaten Arizona State (in Arizona), in which they actually trailed 17–6 in the second quarter. UCLA quarterback Brett Hundley put himself back in the Heisman race with 355 yards passing, 4 TD passes, and another 72 yards on the ground and a rushing TD. 7. Auburn (4–0): The Tigers had a pair of 100-yard rushers in their 45–17 win over Louisiana Tech Saturday—the second time they turned the trick this season. Auburn’s schedule is about to get very tough though as the Tigers face LSU, Mississippi State, South Carolina, Ole Miss, Texas A&M, and Georgia—all in a row. 6. Notre Dame (4–0): The amazing part of Notre Dame’s 31–15 win over Syracuse was that the Irish did so despite committing five turnovers, to the Orange’s one. It helps when your quarterback (Everett Golson) goes 32/39 passing for 362 yards and 4 TDs. 5. Oklahoma (4–0): The Sooners, who were off last week, are ninth in the nation in scoring at 44.8 points per game, but they’ve yet to play an opponent that can actually challenge them. This Saturday represents their first real test. 4. Texas A&M (5–0): The Aggies rolled up an impressive 498 total yards in regulation in last week’s come-from-behind 35–28 win over Arkansas, despite holding the ball for just 23 of the game’s 60 minutes. Despite their scoring output being 20.3 points below their season average, they got the all-important win to give them the best record in the SEC at 2–0. 3. Florida State (4–0): Jameis Winston’s performance against N.C. State Saturday (26/38 passing for 365 yards, 4 TDs) after Florida State fell behind 24–7 in the first half, might have put him back in the Heisman race. 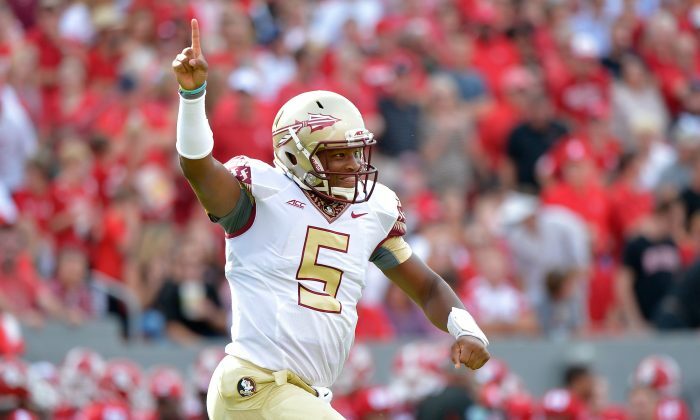 Either way, the Seminoles 56–41 win keeps them in the playoff hunt as their overall winning streak reaches 20 games. 2. Alabama (4–0): Crimson Tide receiver Amari Cooper has amassed 43 catches and 655 receiving yards (second in the country) through just four games, and he’s yet to have less than 130 yards in any game. 1. Oregon (4–0): Oregon quarterback Marcus Mariota looks like the Heisman leader at this point, barely edging out Georgia running back Todd Gurley. While Mariota has averaged 283.8 passing yards, 4.3 TD passes per game, and has an NCAA-leading 218.0 passer rating he’s also been a threat on the ground with 214 rushing yards and three scores for the undefeated Ducks. Gurley is eighth in rushing with 610 yards for the season, and averages 8.8 yards per carry—highest among the top eight rushers.